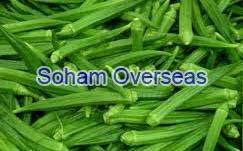 The Fresh Lady Finger, also known as Okra is a rich source of iron and dietary fibers. This tasty vegetable lends itself as a tasty snack or a great accompaniment with rice and bread by itself or mixed with other vegetables. A popular vegetable in most cuisines this produce we offer is widely appreciated for its superior quality and tender freshness.